Charitable meat donation program allows hunters to feed the hungry. In 1992, archers in Missouri began a program to share the deer they harvested with those less fortunate. From that beginning developed a statewide system run by the Conservation Department (MDC) and the Conservation Federation of Missouri called Share The Harvest, a program that provides an easy way for hunters to donate venison to Missourians in need of red meat. Share The Harvest is a WIN WIN WIN program. Hunters win by doing their part to help people in need; cooperating processing plants win by getting positive feedback for their involvement and donations of locker space; and participating organizations win by having a ready-made service project for a good cause. Plus, the Department of Conservation has yet another tool to use in management of Missouri’s valuable deer resource. Processing fees are covered entirely or in part by numerous local sponsors, along with statewide sponsors that include: MDC, Shelter Insurance, Bass Pro Shops, Missouri Chapter Safari Club International, Missouri Chapter National Wild Turkey Federation, Midway USA Inc., Missouri Food Banks Association and United Bowhunters of Missouri. Many families and individuals have no dependable source of protein in their diets. Red meat can provide that important component. Deer is a valuable source of protein; but, unlike most red meat, is unusually low in fat. Through Share the Harvest, Missouri hunters can help provide this part of the daily diet. Who can get the meat? Many people in Missouri can benefit from this program. Families or individuals simply have to contact a participating distributing agency; the agency will allocate the venison according to its supply. How do hunters donate venison to the program? It’s easy to donate. 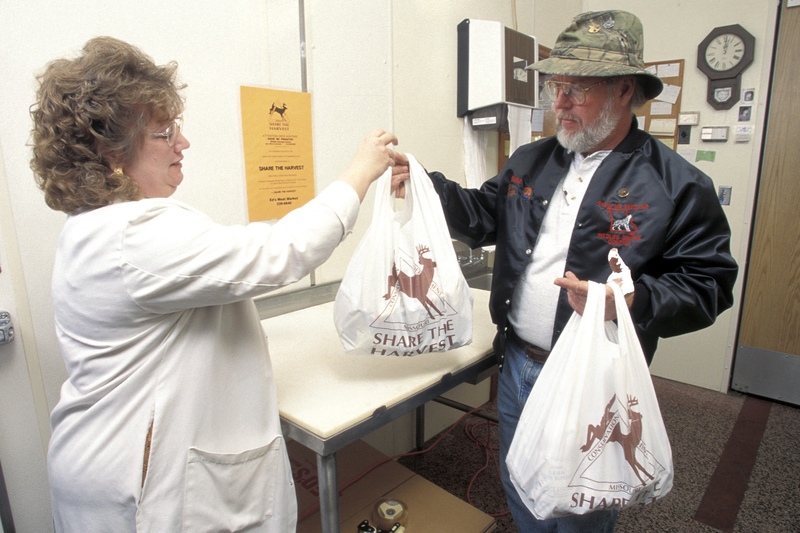 Hunters take their deer to an approved processing plant (see list in the “Fall Deer and Turkey Hunting Regulations and Information” booklet or go to https://huntfish.mdc.mo.gov/hunting-trapping/species/deer/deer-share-harvest, and simply tell the processor how much venison they wish to donate. The hunter has the option of donating a few pounds or the whole deer. There is no price reduction for partial donations. The processor then packages and stores the meat until it’s transported to a distributing agency by the coordinator. Agencies receiving venison will distribute it to ensure that all venison is used and is goes to where it serves the greatest need. The Conservation Federation and its partners will reimburse processors, at an amount set each year, to process a whole deer donated to Share the Harvest. Hunters who donate an entire deer will complete a voucher provided by their processor. The hunter’s bill is automatically reduced by the set amount. At the end of the season, processors will send the vouchers to the Conservation Federation for reimbursement. Additional funds, which may be available from local sources, can further reduce processing cost. In some instances the entire processing cost may be covered! This is especially true in those areas of high deer density where a reduction in the deer population is warranted. Contact your local processor for more information. For each $75.00 you donate you provide for the procession of 1 deer. Contact Micaela Haymaker, CFM’s Director of Operations, to arrange a donation.